We were starting to get worried that an auto show in France was lacking in Gallic oddities. 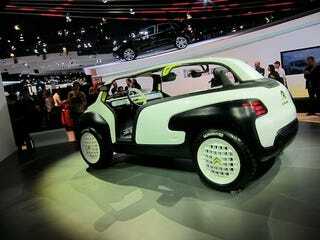 Then Citroën showed off the Lacoste, a compact concept with an inflatable roof, no doors and a power lowering windshield. Bon dieu! Rumors on the street say Citroën might actually build the Lacoste, which resembles a Jeep reworked by Parisian fashion designers running on high-test absinthe. The concept uses a three-cylinder engine of undisclosed force, and the design clearly makes the Lacoste mostly for use near the golf course or beach. Like the Izod alligator logo on its flanks, its only natural prey appears to be preppies.